…..but only if you CAN hear. That is the nub of the problem. 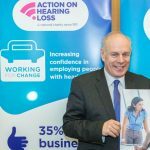 People with hearing difficulties find it increasingly difficult to obtain good jobs and keep them. Employers are not always sympathetic. There is, sadly, still a stigma surrounding any disability – including the least visible, like deafness. Action on Hearing Loss (it used to be called the Royal National Institute for the Deaf) aims to change such attitudes. They have published two detailed reports examining the extent of the problem and offering several potential solutions. When they asked for my support I was happy to comply.